This OG7005 gas solid top range is at the heart of large commercial kitchens. OPUS 700 oven ranges are robust, durable, incredibly reliable and stylish too. Choose from a wide range of gas, electric and dual fuel models. 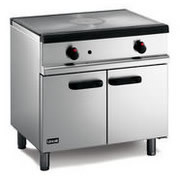 Separate boiling tops are available for counter top use or as boiling tables with optional floor stands.